Call it magic, or call it a happy coincidence: the temperature of liquid helium (minus 269 °C) is precisely that which is required to achieve superconductivity in niobium-tin and niobium-titanium alloys. Such a temperature is indeed very, very cold—absolute zero (minus 273.15 °C), the lowest possible temperature, is only a few degrees colder. The three coupled units that form the ITER cryoplant will be the largest in the world, with 75 kW of combined cooling power. The second most abundant element in the Universe and also the second lightest, helium was first identified in the spectrum of the Sun in 1878, hence its name which derives from Helios, the ancient Greek personification of the Sun. Used in cryogenics, arc welding and the silicon wafer industry—as well as for party balloons and airships—helium is extracted directly from natural gas. It is produced mainly in the US, Qatar and Algeria. In ITER, huge volumes (approximately 25 tonnes) of liquid helium will be circulated throughout a complex, five-kilometre-long network of pipes, pumps and valves to keep the 10,000-tonne magnet system at superconducting temperature. Helium will also be required to provide cooling power to the thermal shields, which reduce the large temperature gradient between the superconducting magnets and the tokamak environment, and the cryopumps that use extreme cold to achieve high vacuum in the plasma chamber. As a consequence, the ITER cryoplant—three coupled units that will provide cooling fluids to the whole installation—will be the largest in the world, with 75 MW of combined cooling power (1). Liquid helium will be delivered to ITER in 40-cubic-metre containers. (In a prowess of insulation technology, the -269 °C temperatures will be maintained throughout the 45-day-long journey from the production site to the ITER cryoplant. About seven container loads will be needed to fill the entire helium cooling circuit of the ITER installation. The complexity of the cooling processes, along with the flux rate required for the cooling of magnets, cryopumps and thermal shield, has dictated the size and design of the cryoplant. The soccer field-size installation will comprise three identical liquid helium plants—the best solution in terms of technology, economy and risk. Each plant will rely on six powerful megawatt-class screw-compressors, four high-speed turbines and ten aluminium-brazed heat exchangers assembled in 20-metre-long vacuum-insulated "cold boxes." Operating the cryoplant will require 35 MW of electrical power—comparable to the needs of a European town with a population of approximately 45,000. The cryoplant will operate non-stop but will only deliver its maximum cooling power during plasma discharges. Helium is not the only ultra-cold fluid that the cryoplant will produce. Liquid nitrogen, at a temperature of minus 196 °C, will be used as a "pre-cooler" in the liquid helium plants. Nitrogen, which accounts for approximately 78 percent of the air we breathe, will be extracted directly from the atmosphere in an on-site gaseous nitrogen generator with a production capacity of 50 tons per day and then processed in two large liquid nitrogen plants. Magnets are the main consumers of cryogenic power (45 percent), followed by the thermal shield (40 percent) and the cryopumps (15 percent). But of the total cryogenic power delivered by the cryoplant, only 75 percent will actually cool the machine components—the remaining 25 percent of the nominal 75 kW will be needed to compensate the warming of the fluid due to the rotating pumps and, to a much lesser extent, the thermal losses in the five-kilometre long cryodistribution network. The cryoplant's ''cold boxes'' are currently being equipped with internal components at the Air Liquide factory in Sassenage, near Grenoble, France. 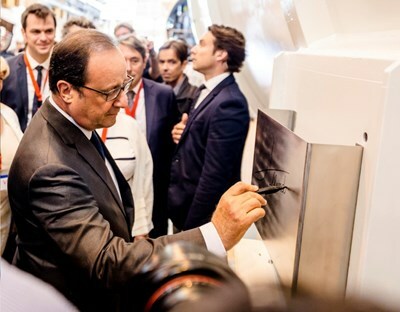 During a visit to the factory last summer, French President François Hollande autographed one of them. However sophisticated the technology implemented, leaks will occur. Based on experience at CERN, where helium is also used to cool the superconducting magnets in the giant accelerator, ITER experts consider that between 10 to 20 percent of the total helium inventory will be lost in the course of one year, mainly during maintenance phases. Although some of the helium will be recovered, an average of one 40-cubic-metre container per year will be necessary to compensate the losses. Three parties are associated in the procurement of the ITER cryoplant: Europe (the liquid nitrogen facility and auxiliary systems), India (the interconnecting lines and cryodistribution equipment), and the ITER Organization (responsible for the direct procurement of the liquid helium plant). 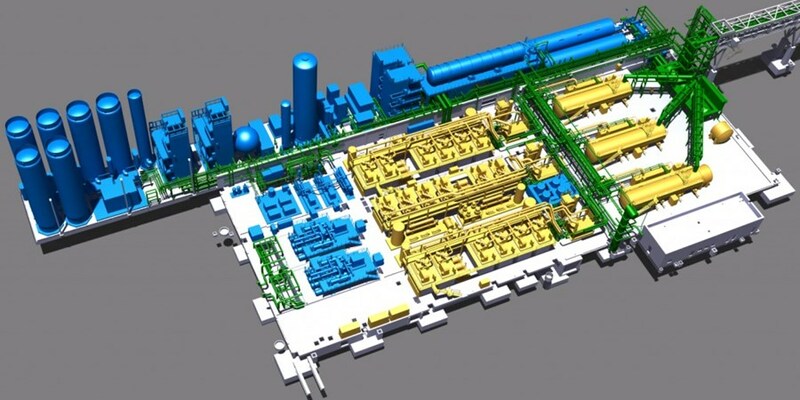 The design of the cryoplant was finalized in 2015 and manufacturing will be complete by the end of 2016. 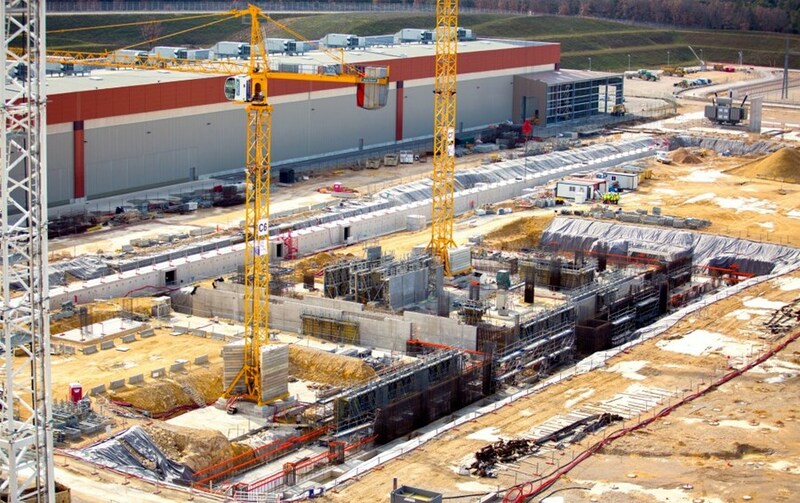 On the ITER platform, work is progressing on the foundations of the building that will accommodate the cryoplant. The completed building structure should be delivered in April 2017. (1) The Large Hadron Collider (LHC), at CERN, achieves a cooling power of 144 kW at 4.5 K with several cooling units located around the accelerator's ring. 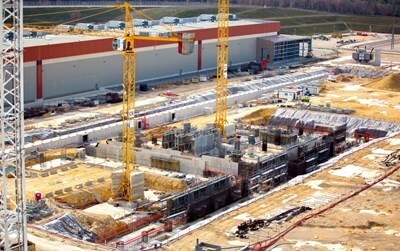 ITER's cooling units are located in one single installation.